Acat was the Mayan patron deity of tattoos or the art of tattooing. Mayans believed that they could imbibe some of the characteristics of a god by tattooing his features on their body. So tattoos really served a religious purpose and the process with which they were inscribed by the Mayans was very painful. Because of the painful nature of the procedure, not a lot of Mayans opted for tattoos. Those who did were deemed brave. Mayans believed that Acat blessed the ink, needles, the hands and the works of the artists who drew tattoos. Apart from being called Acat, the patron deity of tattoos was also given certain other names in the Mayan mythology. These include “Ah cat”. While Acat meant “reed” in Mayan, Ah Cat meant “He of the storage jar” and may have been a reference to the ink of the tattoo artist. Other names that appear for the same deity in the Mayan mythology include Ah-Kat, Acaat and Acat-Cib. Despite the variations of the names, each of these deities was associated with the art of tattooing. He is also called Becab, or the Becab of the East in some Mayan sources. Acat was the Mayan patron deity of tattoos or the art of tattooing. Tattoos had major religious significance for the Mayans. They believed that by drawing the symbols of gods on their bodies, they could attain to some of the characteristics of those gods. So accuracy was highly valued in such tattoos. The procedure of tattooing itself was quite painful and few Mayans chose to have tattoos made on their bodies. Men usually had tattoos made after their marriage while women had tattoos made on their upper body parts such as the arms. Acat was the deity who helped the people opting to get tattoos. Acat was most prominently the deity who helped the artists making tattoos on other people. The art of tattooing had religious significance, so the artists were required to be fairly accurate in their depictions. Using old methods of tattooing, it really required a great deal of skill to make tattoos without any mistakes. To accomplish this, the artists first called upon Acat to bless them, and their needles and ink and other equipment they used in the art. After seeking his help, the artists then began working on the tattoos. According to Mayan mythology, Becabs were four divine entities who were the creator gods. They created the current version of the world. After the creation of the world, they were tasked with the working of the winds and given the responsibility of holding up each of the four corners of the world. These four gods created a confluence of negative and positive energies, and out of these energies they created humans being as well as the entire physical realm. Different Mayan versions offer differing traits of the Becabs but what is found consistently in many Mayan sources is the associated of Acat with the Becabs. It has been surmised that Acat was one of the Becabs, the Becab in the East to be specific. Apart from being the patron deity of the tattoos and tattoo artists, Acat is also accorded another major role in the Mayan pantheon. He is considered one of the Life spirits. This may also hint at his association with the creator gods, Becabs. In this role, Acat is said to be concerned with growth of life. He is further regarded as the spirit who is charged with overlooking the growth of foetuses, thus ensuring the growth of new life from old life. Little information directly concerned with Acat is found in Mayan sources. However, a number of deities bearing a similar role or a similar name as Acat are found in Mayan mythology. Among these, for example, is Acatl who is the god of dwellings. In some sources, a deity named “Ah Cat” is mentioned who is associated with a storage jar. Acat’s own name means “reed” in the Nahuatl languages. This may have been meant to refer to the reeds used by Mayan artists in the tattooing process. Like many other Mayan deities, Acat has a number of roles associated with his name in Mayan mythology. Different Mayan sources, and Mayan culture across different cities, deemed Acat as a deity with their own conceptions of his traits. Some Mayan sources, for instance, make Acat out to be the son of the Mayan god Itzama and say that he is the Becab of the East. In this role, he is the sky bearer and holds up the heavens in the East of the Earth. This manifestation of Acat finds an equivalent in the Aztecs who hold Acatl as their god of the east region. Like Acat, Acatl is also associated with the role of a sky bearer. 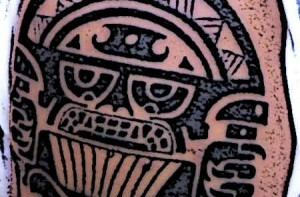 Acat was a Mayan deity who was primarily associated with the art of tattooing. He was considered the patron deity of tattoo artists. Tattooing itself was considered an act of religious significance. People who had tattoos of gods made on their bodies believed that by so doing, they would be able to attain some of the characteristics of these gods. Tattoo artists invoked the help of Acat before embarking on their art. Acat also had a range of other roles and characteristics ascribed to him in Mayan mythology. He was, for instance, considered the god of fertility and growth. In this role, he was considered the deity who looked over the foetuses while they were in the womb. Another unique role was associated with Acat, he was considered one of the four Becabs who created the world and the mankind. In some Mayan sources, he is called Becab of the East. This indicates that he was considered one of the four Becabs situated in each cardinal direction and tasked with holding the heavens above the four corners of the Earth.